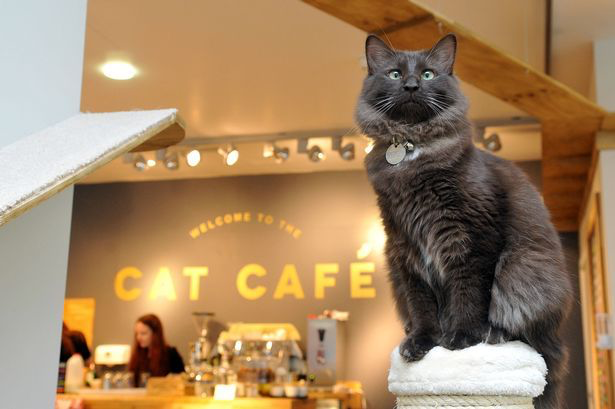 An animal café is a restaurant or coffee shop that offers the ability to interact directly with domesticated animals as the primary element of a customer’s experience. Animal cafés are more commonly known as cat cafés since they originated with cats; the trend began with Cat Flower Garden in Taipei, Taiwan in 1998. These themed restaurants have sharply risen in popularity since then. Locals and tourists alike flock to animal cafés for the enjoyment and relaxation they provide. This is perhaps the most obvious benefit to visiting: the chance to boost one’s emotional state by spending time with animals. Interaction with pets has been proven across multiple studies to reduce levels of stress and contribute to overall positive affect, so animal cafés can easily be considered a pleasant contribution to human health and wellbeing. Animals featured in some restaurants include not only cats and dogs, but unusual animals such as goats, hawks, and owls. These more exotic animal cafés are found mostly in Asia, where the idea ultimately began and thus where the cafés expanded the most rapidly. However, although technically permitted under the law, these operations are not necessarily ethical. Most exotic animal cafés disregard pressing externalities, namely these animals’ right to freedom and contentment. Certain animals require roaming space and should not be forced to face physical constraints, aspects that traditional pets are often accustomed to. Even more, these animals are forced to break free from natural sleep and wake cycles and face bright, noisy café conditions that stray greatly from their ideal habitats. Driven by the prospects of profit and pressured by growing customer demand, café owners often unknowingly abuse these animals which leads to high stress and, subsequently, premature death. Though animal cafés are advantageous for humans in that they boost mood and provide amusement, those that feature exotic animals must be restructured or removed in order to ensure that these animals’ safety and best interests are considered. It is imperative that animal rights are a priority alongside guests’ entertainment in order to ensure complete, transparent ethicality. For instance, some animal cafés feature strictly rescue pets and offer the ability to adopt them, such as Los Angeles’s The Dog Café, self-declared the first dog café in America. “The Dog Café’s mission is to revolutionize dog adoption by reinventing the way people connect with rescues who need homes,” The Dog Café’s website states. More animal cafés must stray from keeping exotic animals in undesirable conditions and instead broaden their focus to encompass animals that are meant to enjoy spending their lives indoors. Globally, most populations of fauna are already in decline, and therefore the last thing animals need is another human-prompted reason to fear for their lives. Op-Ed: Is America the Gun?